Panora, Iowa – The team of Tracy Vest and Ben Montgomery shared the Iowa PGA Pro-Pro #3 title with the team of Chad Proehl and Judd Gibb at Lake Panorama National Golf Course on Monday. Both teams finished at 7-under-par (65). 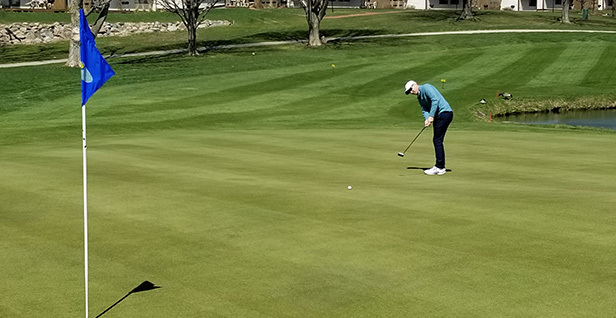 Teams for the Iowa PGA Pro-Pro #3 were comprised of two Iowa PGA Professionals competing in an 18-hole team event, one best ball of two format. Teams were formed by the Iowa PGA Professionals or, if needed, randomly by the Iowa PGA. Vest of Blue Top Ridge Golf Course and Montgomery of Twin Pines Golf Course carded a bogey free round with seven birdies. The duo combined for five straight birdies on Nos. 7-11 in route to their victory. Proehl (Sugar Creek Municipal GC) and Gibb (Lakeside Municipal GC) also carded a bogey-free round on Monday. Their round featured three straight birdies on Nos. 1-3 and two straight birdies on Nos. 8-9 to make the turn at 5-under-par. The duo added two more birdies on the back nine to split the victory with Vest and Montgomery. In addition to the team event, the Iowa PGA Pro-Pro #3 featured individual competitions for the Open, Senior and Super Senior Divisions. Jay Giannetto, Clark Smith and Ben Montgomery all tied for first place in the Open Division, carding 2-under-par 70. Giannetto registered a bogey-free round with birdies on number 10 and number 12 to claim a share for his first victory of the 2019 season. Smith carded six birdies on the round for his first individual title of 2019. Montgomery also tallied six birdies to ink his first victory of the season. Proehl carded a 1-under-par 71 in the individual competition to win the Senior Division. This marks the first Senior Division victory for the 2018 Senior Player of the Year. Mark Ruthey and Jim Henry tied for first place in the Super Senior Division at 2-over-par 74 for their first victories in the Super Senior Division. The Iowa PGA would like to thank Lake Panorama National Golf Course and its entire staff for hosting this event. The 2019 season continues next Monday, April 22 with the Mizuno 36-hole classic at Oakwood Country Club. Registration for this event closes Tuesday, April 16 at 11:59 p.m. Click here register.